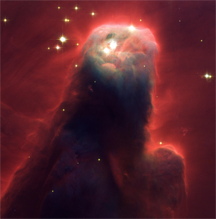 Volume 5, Issue 15; April 13, 2005: Shining Some Light on "Going Dark"
The Cone Nebula as imaged by the ACS camera of the Hubble Space Telescope. Courtesy Space Telescope Science Institute. Something that rarely works: sending a query in email demanding information, accusing the recipient of failing to report, and including a CC to the recipient's boss, to the CEO and to the Master of the Universe. See "The Tweaking CC," Point Lookout for February 7, 2001. Pillorying the offender in a general email to the team, or at a meeting — especially in his or her absence — is likely to arouse anger and resistance. Describing the problem to anyone who will listen will likely be seen as character assassination. Harassment and intimidation, in person or in other media, are always unethical and unacceptable. And they just plain don't work. See "When You're the Target of a Bully," Point Lookout for March 17, 2004. The deterrence theory of punishment is questionable in any case, but in the team environment it's downright toxic. Waiting until the annual review period to then clobber the victim with a truly horrible report doesn't resolve the immediate problem. Try the following steps instead. They're arranged in roughly increasing order of escalation. You probably already tried all of these. They haven't worked. This probably won't work either, but you have to try. Calling in the early morning, during lunch, late evenings, or weekends might work, if the subject is avoiding answering calls during business hours. If the subject is screening your calls using caller ID, mask your ID or call from an unusual number, such as a conference room, a friend's mobile, or a colleague's phone. Next level: call from the credit union, HR, or Security. If you're remote, this isn't an easy option, but it might work. Consult your boss for ideas, influence, and moral support. This is a last resort, but it usually works when all else has failed. When you finally make contact, remember to remain calm. If the incident is a first-time offense, explain your concerns seriously and respectfully and demand respect in return. If the incident is part of a pattern, you've got a larger problem, and you need more information to figure out what that problem might be. For instance, the "offender" might not be an offender at all — he or she might have been directed to go dark by someone up the management chain (I've seen this happen). Tread carefully. Would you like to see your comments posted here? rbrenwqxCWruaKRateHAqner@ChacfhNhdvcuGWkDOTJPoCanyon.comSend me your comments by email, or by Web form. See also Project Management, Effective Communication at Work and Conflict Management for more related articles. I offer email and telephone coaching at both corporate and individual rates. Contact Rick for details at rbrenNPleFZjAMiBIBheXner@ChactjzfNBzCwQEWBgJHoCanyon.com or (650) 787-6475, or toll-free in the continental US at (866) 378-5470.